There is bad news - natural disasters, people trapped in poverty - but there's also good news - of how New Zealand Rotarians and the public are donating, and also volunteering their time to make a difference. There is bad news - natural disasters, countless stories of communities trapped in poverty, but there is also good news - of Rotarians and the public of New Zealand giving and some volunteering their time to make a difference. Clean water and sanitation are vital to health. In Fiji we’ve been targeting 22 communities that are experiencing severe hardship mainly because they don’t have access to clean water for their drinking, cleaning and cooking needs. 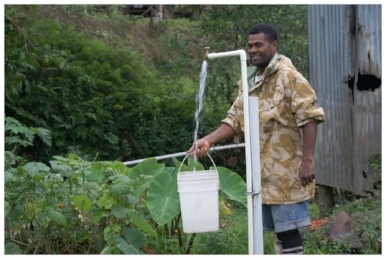 For the past decade, Rotary New Zealand has partnered with Rotary Pacific Water for Life to provide clean and reliable water sources to 8 villages, 9 settlements and 5 primary schools. With support from the New Zealand government, further financial support has now been guaranteed until March 2017. The water and sanitation projects make a huge difference to the villagers’ health. Having safe water close at hand means that the women and children no longer have to walk long distances to fetch water from creeks and streams that may be contaminated. Clean water and sanitation reduce the risk of people becoming ill and possibly dying from water-borne diseases and diarrhoea. Children really benefit when water and sanitation in schools are improved. Where schools used to have to close when water ran out or sewage systems failed, now they can remain open all the time. These projects are just three of those undertaken by New Zealand Rotarians, volunteers and partners. Do contact us if you have stories and photos you would like to share via this website. Please include your name, email and/or physical address, Rotary club (if applicable) and daytime phone number. Dave Wilson and his wife Margaret have spent years making sure that families caught in disasters have the essentials they need. Years of selfless service saw him profiled as a Good Sort on television. Dave - you've well and truly earned the title and a long overdue holiday. Since 2007 Rotary New Zealand has distributed 5,588 Emergency Response Kits (ERKs) to countries in the Pacific - the Solomon Islands, Fiji, Samoa, Tonga and Vanuatu. None of this would be possible without the hard work of our volunteers - Rotarians, their families and friends. 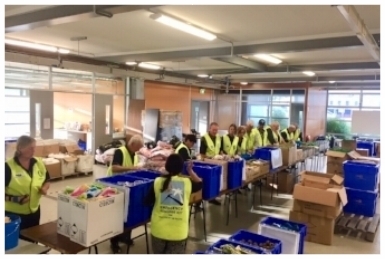 Packed in a warehouse in Panmure, Auckland, the ERKs are sent by sea to secure places in the Pacific where they can be accessed at short notice in the event of a natural disaster such as a cyclone, earthquake or tsunami. In June and July this year, 322 volunteers filled 2 6-metre containers with 598 ERKs, 148 of which are now bound for Samoa. Last year’s stock is now in Tonga to replace the Kits that were distributed to families after Cyclone Gita hit in February 2018. After so many years of experience, ERK packing is a highly organised activity that takes 40 hours to complete. While it’s demanding work, it’s also a time to enjoy the company of others who all have a common purpose - helping Pacific communities when disaster strikes. Thank you to our dedicated volunteers and donors who make our ERK initiative possible. A long-term building programme on Taveuni Island in Fiji was given a real boost when volunteers from three New Zealand Rotary clubs arrived to help. 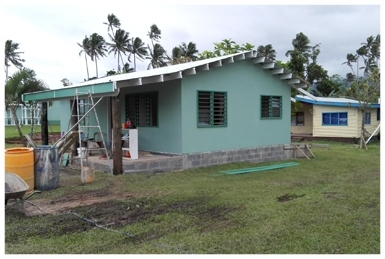 The major construction programme is managed by the Rotary Club of Taveuni. 16 school teachers’ houses have already been built and now a further 12 are planned plus 6 twin classroom blocks at various schools. The Club employs a crew of local builders, but it’s a big workload and when the volunteers lend a hand, it not only accelerates the build, it also saves money. All buildings are constructed to withstand the devastating effects of cyclones. Volunteers this time included members from the Nelson, Whakatu and Taradale Rotary Clubs. Twelve months earlier, one of the volunteer Rotarians from Nelson had taken four non-Rotarian volunteers from Auckland to the Island to help build a school teacher’s house at Nuisawa school. It was this first very positive experience that led to the latest trip, a much larger exercise. Accommodation for the volunteers was in a guest house belonging to the local Rotary Club’s construction manager. Every day, the team drove 45 minutes over rough, pot-holed roads to reach the construction site in Lavena village. The school teacher’s house already had its exterior cladding and roof on, so the team completed the partition walls, installed wall linings, fitted windows and painted all surfaces. The local building crew were also on site, accommodated in the village. A real team effort and a rewarding experience for all. otary New Zealand assists its partners in providing support to those living in poverty or affected by natural disasters. Our goal is to create sustainable outcomes in the form of a hand up rather than a handout. Rotary New Zealand projects are managed by experienced people in both donor and recipient countries. Projects are professionally managed and administrative costs kept to a minimum. This means more of your money gets to where it’s needed most. Rotary reserves the right to levy 5% on donations as a contribution to New Zealand administrative costs. In the unlikely event that any ‘appeal’ funds received exceed our ability to spend them on a specific cause advertised, they will be redirected to another emergency response or development activity where the need is greatest. Thank you for making Rotary New Zealand your charity of choice for overseas aid. RNZWCS Limited is a registered charity - CC26860 and is listed within Schedule 32 of the Income Tax Act 2007 - recipient of charitable or other public benefit gifts - with overseas donee status.